The following images are taken from the little chapel which was the actual room in which our patron St Benedict Joseph Labre died. It is on the street in Rome, Italy named Via Dei Serpenti right behind the Church Sancti Maria Dei Monti. 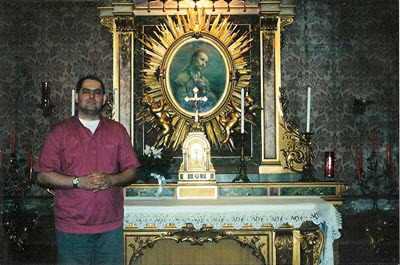 In the chapel I am standing in front of the small altar- within it St. Benedict Joseph Labre’s bed is preserved. His clothing which hung on him as rags which were barely enough to keep him modest. These pictures remain as witness to the events spoken of in his life which you can read about later. Please visit our Room of Hope where you can go to Virtual Adoration and leave prayer intentions and light a votive candle. We ask our members to request a yearly Mass offered for the Guild of St. Benedict Joseph Labre- on or near April 16th which is his feast day. Eternal Father, Through the Blood of Jesus, Have Mercy: Console us in this moment of need and tribulation. As you once consoled Job, Hannah and Tobias in their afflictions; And you Counsellor, of the Afflicted, Mary, Pray and placate God for us, and obtain for us the grace for which we humbly pray.